"Hi," says the male caller. "You need to send a police car and an ambulance to the dirt road that runs off Water Street." "Ah, there's been a shooting," says the caller. "Okay, how many people are shot?" The caller hangs up. The dispatcher calls back, gets an answering machine. "Hi, this is Kevin Morrissey. Leave a message, and I'll get back to you as soon as I can..."
–Transcript of Kevin Morrissey's July 30, 2010 911 phone call. Nearly three months after Virginia Quarterly Review managing editor Kevin Morrissey took his own life, stories are still being penned about what the tragedy revealed about the troubled inner workings of the award-winning magazine: charges of favoritism, spiraling spending, poisonous tensions between staff members, and the hot-button suggestion that the magazine's editor, Ted Genoways, bullied the 52-year-old Morrissey in the last few weeks of his life. Documents recently made available to the Hook show that Genoways was burning through VQR's endowment, hiring an intern for a key office role without going through the usual state procedures, and–- perhaps most surprisingly–- planning to take advantage of the intern-turned-employee's million-dollar-plus donation to another program to save his own struggling enterprise. Meanwhile, as the official UVA investigation into the management of the magazine continues (web update: the report was issued shortly after this story was posted), two recent stories have taken a different tack: casting Genoways, not Morrissey, as the hapless victim of a reckless rush to judgment. questions to a lawyer. Back in mid-September, however, the Hook again asked Genoways to explain how things had unraveled so disastrously at the magazine, and why he had accused Morrissey of "unacceptable workplace behavior" and banned him (and former web editor Waldo Jaquith) from the office, and from performing his duties as the managing editor, without telling him what he had done wrong. Asked how he felt about the beating he's taken in the press, Genoways shied away from playing the victim. "Whatever pressure and anxiety I've felt in the face of media attention pales in comparison to my sense of loss over Kevin's death," said Genoways. " People seem to forget that Kevin and I worked side by side for the better part of a decade, and hung out together a lot outside of the office. I miss my friend." "I really wish I could answer these questions," responded Genoways. "They're legitimate questions, and there are legitimate answers. But I'm bound by confidentiality." However, in stories recently published in Slate and C-Ville Weekly (and presumably another one forthcoming in GQ Magazine), Genoways appears to have become unbound. Asked by C-Ville about the alleged bullying, Genoways defended himself. Genoways appears to have chosen his interviewers wisely. The story in Slate was written by Emily Bazelon, who has famously come to the defense of the six high school students criminally charged with bullying Western Massachusetts high school student Phoebe Prince, the 15-year-old ninth grader who hanged herself last January. Prosecutors in Massachusetts allege that months of bullying led to Prince's suicide, but Bazelon has argued that the bullying reports may have been exaggerated. "It's hard to see how any of the kids going to trial this fall ever could have anticipated the consequences of their actions, for Phoebe or for themselves," wrote Bazelon. "Should we send teenagers to prison for being nasty to one another? Is it really fair to lay the burden of Phoebe's suicide on these kids?" Replace "kids/teenagers" and "Phoebe" with "Genoways" and "Morrissey," and you have the basic thrust of her take on the VQR story. C-ville Weekly's take on the story, too, makes no apologies about its intentions. In an accompanying editorial, editor Cathy Harding asserts that Genoways has been "recklessly accused" and touts the paper's 4,410-word account as "more complete that what's come before." Yet there are things missing from the C-Ville and the Slate stories. For starters, there was no mention of long-time former VQR staff member Candace Pugh, the woman who won a year's salary from UVA five years ago after alleging that Genoways bullied her out of her job at VQR. Of course, Morrissey took the reason for his decision to end his life with him. VQR staff members describe him as distraught during the final weeks of his life, and some feared he was suicidal, but he provided no specific reasons in the suicide note he left, saying only that he couldn't "bear things anymore." The 911 call, a recording of which the Hook has obtained, doesn't reveal much either, save for the business-like way Morrissey handled his suicide. "To diagnose someone or render a judgment about causation is almost always a dicey undertaking, even with extensive information," says David A. Jobes, a psychology professor at the Catholic University of America, and a nationally recognized suicide expert. Of course, no one would be speculating publicly on why Morrissey killed himself if it hadn't been for what his act began revealing: questionable emails to staff; a temper tantrum by Genoways after being denied tenure; unrest among past and current VQR staff; and the creation of a fundraising position to which a donor was appointed. Still, as characterized in those recent stories, Genoways was unaware of how bad things had gotten at VQR, focused as he was on a "bold and urgent plan" to revitalize the magazine's finances and its future–- as well as a Guggenheim fellowship that kept him out of the office. "I was really surprised by that quote," says Pugh, who was the VQR's business and circulation manager for over 30 years before, she says, Genoways forced her out in 2005. "Everyone who has worked under him has been to the President's office to complain about his management." As Pugh points out, Genoways was admonished by the President's office for the way he had treated her after she filed a formal harassment complaint, which resulted in the President’s office handing the responsibility of supervising VQR employees to Morrissey, she says. "But the harassment didn't stop," says Pugh, who describes it as calculated and incremental. "He would constantly accuse me of, or imply that I wasn't doing my job, or criticize me for things that weren't my responsibility. He obviously wanted me out of the office." In the end, Genoways succeeded, but only after Pugh had hired a lawyer and negotiated her severance package with a year's salary under the condition that she wouldn't sue. After over 30 years of service, for which Pugh and other long-time employees were honored by the University during a 2001 banquet ceremony, it was not exactly how she had imagined leaving UVA. "The President’s office just stood by and let it happen,” she says. Ted Genoways and former VQR editor Staige Blackford in June 2003. At the time, Genoways said he wanted to make changes to attract new readers to the magazine, but, despite a shelf full of national awards, the magazine's circulation has actually dropped. In the email to colleagues sent two days after Morrissey's death, Genoways appears to be contradicting his comments to C-Ville about "not knowing," admitting that tensions in the office had begun growing "poisonous" several months before his leave. He also claims that Morrissey's family had told him of the existence of a suicide note blaming him, a claim the family denied and one the actual note showed to be untrue. “In the last six months, my attempts to conceal the inner conflicts of the office were unsuccessful," Genoways wrote in his e-mail. “And many of you saw or sensed the unfortunate rift that grew up between [me and Kevin]. I don't doubt that these conflicts fed Kevin's depression, but I cannot accept the final blame he laid on me." The VQR story often returns to the young wealthy woman with little or no experience in fundraising who arrived at the magazine last November, and whose family are major UVA donors (she herself donated $1.5 million to a UVA program). In spite of her apparent lack of experience, she nonetheless made a quick rise into a position of authority at the prestigious journal. In C-Ville, 24-year-old Alana Levinson-LaBrosse admits that Genoways was seeking an exemption from a "legal search" for her position, but the reporter never questions that potentially improper hire. Slate, too, glosses over the apparent breach of UVA procedures. According to UVA hiring policy, "all University Staff positions must be posted in Jobs@UVa," and hiring officials are "responsible for proactively recruiting and hiring from a diverse applicant pool." Indeed, UVA also has an Office of Equal Opportunity Programs for making sure all UVA departments comply with hiring laws, with the advertisement of open positions being the first step. Asked why such an exemption was granted, UVA spokesperson Carol Wood says that Levinson-LaBrosse's exemption was based on her "qualifications, prior experience, and familiarity with VQR." Asked to detail the specific qualifications and experience, Wood replied that personnel information was confidential. Genoways “assured me that my value as an employee was greater than a check,” Levinson-Labrosse told C-Ville Weekly." A Hook Freedom of Information Act request turned up a document in which Genoways created the position by claiming that UVA's Development Office had failed to raise any money for the magazine despite six years of his entreaties. In May, the development manager position was approved. Though hired on the basis of her qualifications and experience, according to Wood, there appears to be no evidence that Levinson-LaBrosse raised a dime for the VQR during the nine months she was there, or had ever raised any money for an organization, school, or publication other than by opening her own–- or the family's–- checkbook. In a recent email, Levinson-LaBrosse expressed an interest in taking questions from the Hook, but when asked if she had any past fundraising experience, she declined to respond. However, according to a June 2010 VQR document obtained by the Hook detailing Genoways' plan to transform VQR, Levinson-LaBrosse had managed to find one source of cash: a pile she had already donated. According to VQR documents, Frank Levinson has "tentatively" committed $150,000 to the magazine. According to the plan, Genoways wanted to create a new program at UVA called the "Center for Reporting and Research." Moved out of the president's office and over to the Office of the Vice President for Research, the Center would comprise VQR, the currently independent LOOK3 Festival of the Photograph, and the object of Levinson-LaBrosse's $1.5 million largess: UVA's Young Writer's Workshop. The plan also called for "significant funding" for three directorships, faculty status for the VQR editor, and a $6 million fundraising initiative. Strangely enough, while Slate's Bazelon revealed the plans for the VQR merger with the Young Writer's Workshop, she neglected to mention it as the object of Levinson-LaBrosse's $1.5-million gift, vaguely pointing out that she'd given "some of her own money" to UVA. Also missing from the Slate and C-Ville accounts: that the reorganization plan rests on the largesse of Levinson-LaBrosse's father, Silicon Valley tycoon Frank Levinson. According to the plan notes, Frank Levinson has "tentatively committed" $150,000 over three years; and, according to a reliable source, had already cut a check made out to VQR for $75,000 in July. After Levinson-LaBrosse's position was approved, Genoways basically put her in charge of the transition to the VP's office. However, while Genoways has claimed that the transition had a July 31 deadline, UVA s Wood has said repeatedly that nothing had been finalized, and that it was only one of several ideas being discussed. According to some VQR staff members, the decision to place the young intern-turned-staffer in such a position of authority over seasoned veterans may have been the proverbial straw that broke the camel's back. The Today Show's Jeff Rossen (whom Genoways once referred to as a "smarmy" reporter) interviews the VQR's former web editor Waldo Jaquith. "I feel Alana was a major component in Kevin's despair," says VQR circulation manager/assistant editor Sheila McMillen, "in that he felt he was being shoved out as Candace Pugh had, by an inexperienced intern nearly 30 years his junior, simply because she was rich." As for the week-long banishment of Morrissey that Genoways ordered, allegedly motivated by a report from Levinson-LaBrosse, Levinson-LaBrosse tells C-Ville that Morrissey and Jaquith were banned "because their pattern of unprofessional and, at times, explicitly rude behavior toward me in the office was preventing us, as a staff, from getting the transition materials together." "Waldo and Kevin were never rude and unprofessional to Alana," counters McMillen, mentioning that Morrissey had even invited Levinson-LaBrosse over to his house for dinner to try to improve relations. "When I first told her that Kevin and Waldo were banned, she seemed rather shocked and said something like, 'I talked to Ted but didn't mean to get him all mad.'" VQR staffer Molly Minturn says she never witnessed Morrissey being rude or insubordinate, or ever heard such accusations about him. "To the contrary," says Minturn, noting that Levinson-Labrosse's comments were particularly egregious considering that Morrissey is not here to defend himself, "he always seemed to work hard to bring people together in the office, to be professional, and to make himself a model for how people should treat each other." What's more, Bazelon reports that Genoways says he consulted UVA Human Resources before sending the email banning Morrissey and Jaquith from the office, a claim that puzzles Minturn. "I was told explicitly by HR officials, as well as a representative from the President’s Office, that Ted did not consult HR before sending the emails to Kevin and Waldo banning them from the office," says Minturn. "I now wonder where the truth lies." 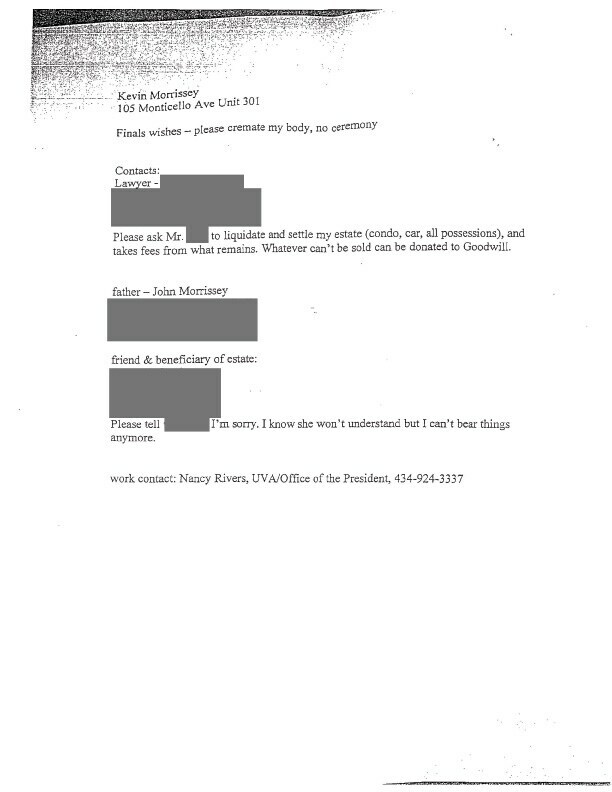 Minturn and McMillen add that the staff tried to have as little interaction with Levinson-LaBrosse as possible, because she was "extremely" sensitive, a major donor to the University, unaccustomed to working in an office, and because they believed she was reporting to the on-leave Genoways. "Neither Kevin nor Waldo got in the way of her getting transition materials together," says McMillen. "Alana was just very offended that they asked whether Kevin ought not to be at some of the meetings about the future of the magazine." Asked about these and other comments from VQR staff, Levinson-LaBrosse said she could not respond to "hearsay." However, Minturn alleges that Levinson-LaBrosse was aware of Genoways' treatment of the staff, telling Minturn once that she would quit if "Ted treated me like he treated the rest of the staff." As the C-Ville reports, Levinson-LaBrosse was recently told through her lawyer that her position at VQR was "no longer available" and that she could work in central development or resign. "I wonder if [Alana] even realizes what havoc she created at VQR," McMillen says. The VQR's long-time home on the West Range. Are the literary journal's days numbered? So who was in charge? In the Slate story, Genoways complains that Morrissey made "substantive editorial changes" to the VQR's Fall issue without consulting him. "This is just not true," says Minturn. "Kevin tried to get Ted's permission about any editorial changes we made while Ted was on leave. Kevin never decided to kill any articles." Genoways also said that he had "not ceded any of that editorial authority" during his leave of absence. However, UVA spokesperson Wood says that "Kevin was asked to become acting editor in Ted's absence," and McMillen says that Morrissey was to "operate as editor in Ted's absence, with all that implies." "Ted told us we could make changes, as he didn't want to be bothered with this while he was on leave," says McMillen. "We made some changes because two articles Ted told us were coming hadn't arrived, and there was a big hole in the issue." Indeed, a July 26 production schedule obtained by the Hook closely matches the version of the VQR currently on newsstands, aside from two long essays Genoways added after Morrissey's death. Morrissey eventually forwarded the message to Genoways, Slate's Bazelon writes, "but not until 10 days had elapsed. When Genoways realized the e-mail was 10 days old, he wrote to Morrissey, 'Just so I'm clear: Why did it take you ten days to forward a message from someone asking our assistance with saving his life? A period during which you sent or forwarded twenty other e-mails to me?'" Morrissey would never respond to that email, as it came about an hour-and-a-half before he killed himself. Morrissey's sister, Maria, has said the email was open on her brother's iPhone, but said she couldn't be sure if he had read it. Bazelon, of course, acknowledges none of the painful irony in what may have been Genoways' final words to his friend and colleague, projecting such urgency about "saving the life" of a journalist in Mexico while his own managing editor prepared to take his. Again, Bazelon also fails to mention key details. Two days before, Morrissey, Jaquith, McMillen, and Minturn had been assured by the President's chief of staff, Nancy Rivers, that Genoways' treatment, particularly his management-by-email, would cease. However, Minturn, too, received a testy email from Genoways that same morning, chastising her for not responding to an email from a writer Genoways was sending on assignment to Iraq who was requesting travel money. Given the assurances from Rivers, the tone of the email was disturbing to Minturn, who replied by saying she knew nothing about the details of the arrangement and didn't normally handle contracts anyway. "After what I've been hearing from HR this week –-the word that the staff has threatened to quit en masse–-my collegiality is a little threadbare," replies Genoways. "So let me rephrase: Please see to it that one of our authors has the money he needs to travel on our behalf." Shaken, Minturn took the email exchange to the President's Office and HR, where she was unofficially diagnosed with “post-traumatic stress syndrome” by an HR counselor certified in diagnosing such things and advised to go on medical leave. Minturn says she's been somewhat embarrassed about how this has appeared in the press, as if she were so sensitive that one grumpy email from Genoways had sent her crying to HR, but as Minturn explains, it had come after weeks of office tension, and only days after Genoways had been told to stop reprimanding the staff via email. As for the email from the Mexican journalist, Bazelon makes an even bigger omission: neglecting to mention that it had arrived during Morrissey's office exile. And according to McMillen, Morrissey and Jaquith had at first thought the note–- sent to a general letters@vqronline.com mailbox–- might be a hoax or a scam when they read it upon their return to the office. Ironically, after Morrissey forwarded the supposedly urgent missive, Genoways waited three days to respond with his admonishments. Ironically, VQR staff say it was Genoways who often withheld information from them about important matters, something Genoways acknowledged to Bazelon. "It's taken me all this time, and the story playing out in the press," said Genoways, "to understand that the staff really meant they didn't feel they were being included in decisions enough." Indeed, as McMillen told Bazelon, "I wouldn't use the word bully, but he [Genoways] was belittling to us; treating us with contempt, not giving us feedback, not responding to e-mails." Pugh uses stronger language about her former boss. “That man should not be in charge of other people," Pugh told the Hook in August. "He’s a danger. I can understand why Kevin did what he did." The C-ville and Slate stories also present the VQR's financial situation through Genoways' eyes, suggesting that the editor was trying to control operating expenses and cut costs. C-Ville suggests that it was the recession that affected subscriptions and led to the VQR's financial troubles. What had actually changed was the amount of money being spent on the magazine. In 2002-2003, during former editor Staige Blackford's last year at the helm, the VQR's fiscal year budget was around $200,000. But under Genoways' watch the budget nearly quadrupled, to $796,000 in 2009-2010. Despite critical attention that included several national magazine awards, circulation had see-sawed and then fallen back to about 2,500, according to circulation manager McMillen (1,650 in subscriptions, 150 complementary issues, and 900 newsstand copies, though McMillen points out that only about 30 percent of those are sold), considerably less than the estimated 4,000 to 5,000 readers the magazine was reported to have had when Blackford retired. According to McMillen, she and Morrissey had expressed their concerns about the editorial direction of the magazine, which had grown less literary and more grimly topical, as a possible reason for subscription losses. "Subscription numbers had dropped, but Ted was convinced it was the result of the economic depression," says McMillen. "We were not able to persuade him otherwise." Under Blackford, the magazine contained a section called the Green Room where Blackford wrote a very small comment about the issue and then proceeded to introduce contributors. Genoways, however, began introducing his own vision for each issue in long essays from the 'Editor's Desk." While VQR had always included some politics and public affairs reporting under Blackford, under Genoways, journalism became an often singular purpose, particularly war reporting. Indeed, three of the last four covers of the VQR feature soldiers carrying weapons. "I canceled my subscription because the journal was no longer a literary magazine, too topical," says VQR contributor Mariflo Stephens, who now teaches creative writing at Hollins College. Stephens says that three of her collegues at Hollins, also VQR contributors, have canceled their subscriptions as well. In the last issue of the VQR under Blackford, long-time Sewanee Review editor George Core offers some advice: "Any successful editor of a given quarterly must establish or continue an editorial program (that is largely based upon the history of that magazine) and hew to the line involved." In her Slate piece, Bazelon says that Genoways was able to pay for international war reporting because "he'd inherited an $800,000 slush fund" from Blackford. However, sources close to Blackford point out that it was a "rainy day fund" that Blackford had managed to save over his 28-year VQR career, with the hope that it would be used to sustain the magazine during tough times. "The University told me, you have to spend it fast, or we will reclaim it," Genoways is quoted in Slate. "So he invested the money in the writing and photography that placed the once-staid journal in the literary limelight," Slate's Bazelon adds. Asked if all this were true, UVA's Wood responded, "As I told the reporter from Slate, I am unaware of any such directive to spend down the endowment. That would not be consistent with University policy." Any way you slice it, $796,000 a year is a risky investment for a quarterly literary journal. And while C-ville Weekly breaks down the sources of VQR's funding (one-third from endowment funds; one-third from income generated by the journal through subscriptions, advertising and licensing; and one-third from “a University allocation”), they neglect to note another possible motive for Genoways' aggressive fundraising efforts: his $170,000 compensation package, which amounts to nearly one-fourth of the magazine's total budget as well as being the approximate amount of the annual deficit the president's office was covering. Asked if allocating nearly $470,000 for staff salaries and fringe benefits makes good financial sense, Genoways responds by saying it "wasn't his call." "I advocated for additional staff, but the President [John Casteen] himself had to decide whether or not those requests were appropriate," says Genoways. "Once those positions were approved, it was up to University human resources to set salary-range and benefits." Genoways also adds that "financial sense" is the wrong way of approaching an organization like VQR. "It's a nonprofit, mission-driven publication," says Genoways, "and by its very nature it is not intended to make financial sense." In his formal proposal to the Vice President for Research, Genoways attempts to sell them on the idea of supporting the VQR and the idea for the journalism center. He can't be accused of lacking chutzpah. "In short, these times demand much more than mere competence or even excellence," writes Genoways. "We are now pushed to anticipate and innovate on a daily basis in ways that require personalities invigorated by working on the very forefront of the field, those who can see a new future rising where others see only the crumbling ruins of the past." Meanwhile, of course, Kevin Morrissey is dead. And many wonder if his death could have been prevented. "There was a lot of communication between Kevin and HR, and I know they were on the brink of mediation beginning," UVA spokeswoman Wood tells Slate. "It was so close." While Genoways may not have literally bullied Morrissey to death, evidence suggests he certainly didn't help the man. According to research by the American Association of Suicidology (AAS) which expert David Jobes recommends as a source of information, any number of things can be what's called a "trigger stimulus" for suicide, including being humiliated and losing status. Add to that other known factors, such as job or relationship stress, guilt, shame, defeat, or rejection, and it becomes a list of nearly all the things that cause spiritual anguish. Indeed, the energetic discussion about the Phoebe Prince case, or Morrissey's alleged treatment at the hands of Genoways, might be stand-in subjects for a national discussion about how we ought to treat each other. Alarmingly, AAS research shows that suicide rates among young adults ages 15-24 have increased more than 200 percent in the last 50 years, and that rates among people over age 85 are climbing as well. While suicide among middle-aged people like Morrissey is less frequent, AAS research shows that has also been rising. Most suicidal people, the research shows, give definite warning signals, desperately want to live, but are unable to recognize alternatives. Of course, major depression is the most frequent diagnosis associated with a suicide. About two out of three people who kill themselves suffer from depression. "A trigger only partially causes suicide in an already highly vulnerable adult," says suicide expert Ron Maris, who heads the Suicide Center at the University of South Carolina. "Suicide is the result of a multi-faceted aetiology over many years, what I call a 'suicidal career.'" Maris, too, declined to comment on Morrissey's case specifically, citing the risk of doing so, but he did weigh in on one of literature's most intelligent suicidal personalities. Was Hamlet's reasoning that taking one's life and ending "the heart-ache and the thousand natural shocks that flesh is heir to" is a "a consummation devoutly to be wish'd" a result of his severe depression? Or is it an intelligent person's reasonable response to the pain and suffering that is often endured in life? "In a sense, Hamlet's reasoning is correct," says Maris, "but most suicides are not rational like Hamlet is. Suicide is more basic than reflective poetry. The locus for suicide is in the gut and heart, not in the mind." Sadly, suicide prevention relies heavily on the person's willingness to talk about the suicidal feelings with someone, research indicates, something that Morrissey apparently did not do. Someone's willingness to listen and empathize is also important, but it can be difficult since dealing with a person who appears to be suicidal can be frustrating and emotionally draining. Indeed, in Genoways' much-quoted email, he appears more annoyed with Morrissey than sad or empathetic, referring to him as "prickly, mercurial, often brooding," criticizing his work performance, and calling his demeanor "often unacceptable for the workplace." Not exactly the way one might be expected to describe a friend or colleague only two days after their tragic death. Asked in September how he felt about the beating he's taken in the press, Genoways shied away from the the "Ted-as-victim" approach adopted in the Slate and C-Ville stories. "Whatever pressure and anxiety I've felt in the face of media attention pales in comparison to my sense of loss over Kevin's death," says Genoways. "People seem to forget that Kevin and I worked side by side for the better part of a decade, and hung out together a lot outside of the office. I miss my friend." Of course, any number of people close to Morrissey might feel they should have done more to help, or perhaps should have acted sooner, but as the AAS research emphasizes, the safety of the person "cannot be guaranteed by anyone–-the goal is to reduce the risk and build supports." At the end of her Slate piece, Bazelon suggests that the ongoing investigation into the VQR's finances and management, and the canceling of the magazine's winter issue, might not entirely be the result of "internal strife" at the magazine, but the result of the "bullying label being applied [to Genoways] where it doesn't fit." Ironically, Genoways himself may have been the first one to use the the label "workplace bully," as it appears in the defense against such accusations in his post-mortem email. Also, Genoways and Levinson-LaBrosse were conspicuously absent from the August 6 memorial service for Morrissey, before many media accounts appeared about the office tensions at the VQR. In fact, their names were not mentioned at the service, and when UVA issued its official press release on Morrissey's death, neither Genoways or Levinson-LaBrosse were quoted or named. At the memorial service, the frustration and anger that VQR staff members and Morrissey's family members felt concerning Genoways' alleged treatment of the deceased, and the slow response by University officials to the staff's requests for help, was palpable. Had the entire staff attended the memorial service, remembered their coworker, and shown support for each other, it's unlikely the story would have ever been featured on the Today Show. Also, while Slate and C-Ville question the "bullying" label, they seem content with the "depressed" label applied to Morrissey. Indeed, both stories characterize the VQR's managing editor as a depressed, dissatisfied employee who was neither willing to nor capable of embracing Genoways' ambitious new plans. It's a characterization that has infuriated those who worked under Morrissey. "Kevin was dogged at his work, meticulous in his detail," wrote Jaquith on his blog, cvillenews.com, the day Morrissey died, aknowledging his friend's struggle with depression, "and one of the finest human beings I’ve had the privilege to know." And as McMillen points out, while 30 VQR contributors have condemned the media coverage and rushed to Genoways' defense, praising him as the person who "turned a previously small and obscure literary quarterly into one of the leading U.S. journals," it was Morrissey–-whom the letter writers referred to as merely "valuable and productive"–- who fine-tuned their work for publication. Of course, the most shocking omission in Bazelon's piece, and C-Ville's too, is the absence of Pugh's story, and what it suggests about Genoways' history managing his staff at the VQR. Yet Pugh tells us that only one other reporter has attempted to reach her since her comments in the Hook, the person working on a planned feature in GQ Magazine. Indeed, Pugh's story is absent from nearly all the coverage of the VQR tragedy. Yet, as detailed in the Hook, she was willing to speak out about the harassment complaint against her former boss. "Those VQR contributors who showed their support for him, they benefited from knowing him," says Pugh, referring to Genoways, "but they never had to work directly under him. I'm glad you're not letting this story die, because I hope the President's office is aware of what happened to me and others." I see nothing wrong with what local girl said! People need to know these things. I was bullied at UVA Med Ctr relentlessly for many, many years! I'm a very bitter person! There's alot of corruption going on in alot of the depts at UVA Med Ctr. There has been alot of employees to quit in my previous dept in the past year due to poor management. The manager was moved to another dept, instead of being fired. Bullying ruins peoples lives. It should be against the law!!!!! UVA brass doesn't care about this kind of thing - never have and never will - unless and until they're on the hook for a big court judgment or their alumni donors start voting with their wallets. THEN they'll get religion. Until then, they'll circle the wagons when something goes wrong, blame the victims and move on. Agree with prior statement: HR exists to protect the institution, not employees. They wrote the book on how to shoot the messenger. I don't see how ANY of them sleep at night doing what they do. Local Girl (as opposed to "local girl"), shame on you for making such egregious accusations anonymously. What were you thinking??? just wanted to point out that, as the other one, there are at least two "local girl"s posting here. The investigation never mentioned the numerous times Kevin tried to contacted HR or University officials for help "before July 30"! I hope the Morrissey family doesn't let this go. It doesn't sound like HR was reprimanded. Rather than putting the HR fox in charge of implementing the new henhouse, how about replacing HR management with competent professionals? Got that right. Contrary to popular belief, HR is only out for HR, definately NOT for employees. Sure, they put on a big show but it's all bull. They just want to do the very minimum to keep from getting sued. UVA is obviously more worried about Genoways filing a multi million dollar lawsuit than in the well being of future employees at VQR. To actually put him back in charge of ANYTHING is mind blowing. They ought to put him in a closet somewhere off Grounds and have him shuffle papers with no one reporting to him. Ã¢â?¬Å?Given the fact that the University had stood by while I had been accused of buying my job as a donor at the institution,” she told C-Ville, ” I did not accept this offer. I resigned.” - Maybe Ms. Levinson-Labrosse can find better things to do with her time. Obviously she does not need to work since she has at LEAST a million to burn, maybe volunteering her time would be a thought. I am sure her literary skills could be handy somewhere. I anticipate a book about the whole thing from her though. Ã¢â?¬Å?I wonder if [Alana] even realizes what havoc she created at VQR,” McMillen says. - doubtful. Question for Howard - what century is HR in now? Ã¢â?¬Å?HR will be tasked with developing a structure within Human Resources in which employee complaints about their supervisors can be taken, registered, and followed up.” Apparently HR Employee Relations doesn't or doesn't know how or isn't encouraged to do their jobs. The audit recommendation is the same as the "restructuring" policy recommendations that were never implemented. Rather than putting the HR fox in charge of implementing the new henhouse, how about replacing HR management with competent professionals? I think you have that backwards Gas (surprise, surprise). Mr. Genoways is clear of wrongdoing at this point. The only thing that can change that is a judge or jury. UVA and Genoways can say anything they like. But the only person or persons that can clear Genoways of any wrongdoing is a judge or jury.... and only then if the family decides to file a wrongful death lawsuit. I've just skimmed this story so maybe I've missed it but what about the quote that Genoways provided early in to the Chronicle that UVa had cleared him of all wrong doing?? Wasn't that completely made up? Good job by Dave McNair. I'm glad he is keeping the story straight, even in the face of UVa doing their best to cover their butts in regard to liability (as they did with Candace Pugh and her treatment). For those of us who knew and liked Staige Blackford and the "literary VQR" it is interesting to see the comparisons of VQR expenses now and then, and the comparisons of subscriptions between the two VQR versions. I've never understood the buzz of the Genoways VQR and I really liked much of the Blackford VQR. Glad to hear Mariflo Stephens and others agree. I've said it before, I will say it again. Bullying in the workplace takes place in almost every federal, state, city or county office. It wasn't that long ago Albemarle County had to pay hundreds of thousands of dollars to an employee when the police department bullied one of their cops and thought they could get by with it. I would like to see the issue addressed nationwide in some sort of policy. IMHO, it's worse than sexual harrassment in the workplace! President Sullivan had an opportunity to clean house at VQR by getting rid of Genoways. Too bad she did not take it. This will of course be swept under the rug as usual. Be interesting to see if they can hire anyone to work under this guy if the magazine starts up again. I mean, who would take a job there after this? How in the hell does he deserve $170K a year? Pathetic. He even used VQR to publish his own book of poetry. Let's not forget the university calling his bluff when he said he had a standing offer somewhere else he would take if they did not give him tenure. He is a proven liar already, a scoundrel, and most likely a cruel person. The audit report is no surprise. All institutions, be they universities, corporations, or others, will always try to protect themselves. That is what PR officials and Legal Departments are tasked with. There is plenty of blame to go around here. Clearly, Genoways is no manager. At best he is ineffective and often absent. At worst, he is a bully with a lot of power. It is egregious to say that UVA had not been officially notified of Genoway's tactics. What about the Pugh situation and its resolution? Clearly that shows a pattern of misconduct. VQR has been allowed special status at UVA - not bound by many of the institutional rules and regulations that govern other programs and departments and totally unsupervised. Former President Casteen is largely to blame for that. President Sullivan had an opportunity to clean house at VQR by getting rid of Genoways. Too bad she did not take it. Are you kidding me - Genoways will never resign, especially if he makes $170,000/year. I can't believe UVA will keep him on staff! Hopefully they're looking at their options on how to get rid of him. employee complaints about their supervisors can be taken, registered, and followed up." Major reform! UVA progresses into the 20th (sic) century. It's kind of like Mad Libs..write an article belittling the signifigance of bullying...insert current victim's name here. It's the UVA WAY! UVA protects their managers. That manager should have been fired!!! If it was anyone else they would have been fired!!! So I guess Kevin will be forgottened and the bullying at UVA will continue. This is a bad ending. Wow, just read the Audit report. First impression is "white wash", but not surprised. Will have to wait and read it again in the morning. However, I do like the comment of "Ted's NOT so excellent adventure." If Genoways has an ounce of grace he will resign. U Va needs to put VQR in the hands of the English Department which needs to turn it from the silly Soldier of Fortune publication it has become back into a lit mag. The new editors should then BEG all its old (pre Genoways) authors to submit materials to celebrate its resurrection as a viable publication. Re Howard's comment on former Pres. Casteen's role: Having the campus lit mag run out of the U. President's Office is a pretty good tipoff that something goofy was afoot. Many of us were predicting the UVA report would be a bland admin. whitewash.Why? First:Mission no.1 at UVa has always been - protect the institution. (That's true at most places but UVa's ingrown admin culture makes it more inset.) Two..former Pres Casteen's role here is not beyond reproach but nobody wants to criticize the retired "Great Helmsman and Earth-Mover." Three- the chief victim of any possible bad practices is dead. Very convenient. The audit report needs a separate article for analysis. The audit ignored anything that happened more than two years ago, including the reported bullying out of her job of Ms. Pugh in 2005. And who wrote the audit's "management response?" It looks like Genoways is again attempting to set up a little private despotism in the Office of Research, another managerial vacuum where he can be unsupervised and unaccountable. The audit apparently was not tasked with asking if it makes sense to spend $750,000 a year subsidizing a literary magazine with only 2,000 subscribers--$300 per subscriber? The audit makes no mention whether a literary quarterly editor who wrote his own contract should be making $135,000 a year? Is any literary magazine editor anywhere else paid that much? At the Kenyon Review, the editor is a professor, who does it in his spare time. Basically it seems this audit tracked nickles and dimes to verify where they went, but was not tasked with the larger question of asking whether VQR should be shut down for being ridiculously profligate, hundreds of thousands misspent. The Kenyon Review was shut down, and a decade later re-invented itself. U Va should do the same with VQR. I read the Audit Report. It is deficient in that it states that no allegations of harassment were noted before June 30, yet Ms Pugh filed just such a complaint and negotiated a sizeable settlement 5 years ago. I wonder why the auditors didn't mention that. Generally the report is pretty milk & water type stuff, as Lynn notes above, but even so, the acknowledgement of spending to publish his own poetry and the lack of detail in recent financial records and credit card transactions should have been enough to have Mr. Genoways removed. For this alum, and former subscriber to the VQR, the University's response to this is very disappointing. Reading the audit - which is no doubt a legal and diplomatic high wire act meant to obscure certain cold hard facts - I don't see how Genoways can remain editor of the VQR. Instead he needs to be indicted for creating an extremely hostile, dysfunctional work environment that has inflicted enormous loss, stress and pain for all involved. How many more transgressions does it take? How many lawsuits will it take to get to the bottom of this mess? Can someone tell me where i can see a copy of the audit report? I think this will be interesting as it will shed light on what President Sullivan's administration will be like. Farewell to both Genoways and the VQR. One is a loss of a titanic ego that, at the end of the day, has no more to contribute to UVA and will be unwelcome in the milieu of American letters. But the loss of the VQR is the loss of an institution and, in its former incarnation, one of the last vestiges of true intellectual life at Virginia. Ted Genoways will remain the editor at VQR. Whoa, hang on a second there, McNair! You talk Genoways picking his media outlets selectively, but didn't you used to work at VQR? Where's your full disclosure, bud? Got much of an axe to grind? Again, as I have already disclosed: I volunteered to read fiction submissions for former editor Staige Blackford in 1992-93 while I was an MFA student at the University. In 1995 the VQR published a story of mine. "Teds not so excellent adventure"
This article diligently explores factual detail with a freshly polished magnifying glass, and we are grateful for that diligence, but it sounds a little too much like a rebuttal brief. Yes, Genoways used Slate and C'ville for transparent spin doctoring. Though, doctor, it's a little late for CPR on the corpse of that particular reputation. Still Mr. McNair should not feel obliged to argue with Mr. Genoways' surrogates Slate and C'ville, and defend his previous take on the subject, with heavy-handed phrases like "strangely enough." Just the facts, M'am. Quote Genoways, juxtapose the contradictions and let Mr. Genoways convict himself. Wow. I just read the audit report. It is remarkable that this report is being publicly posted, but The University is not taking responsibility for much of anything. It all seems to be a result of wrong assumptions leading to consternation. Given the list of new policies it's clear that the system didn't work. There is certainly a lot of parsing about what is an official notification of managerial misconduct and what is not. Yeeeesh. The manager was moved to another dept, instead of being fired. This is what they do. Move bad managers from dept. to dept. til they retire so they poison many different depts.--especially at the hospital. UVA is only concerned about UVA- never the employees. I think folks need to know this in case they might think of going to HR with a complaint. We see how well THAT works out. Barbara, you're right. (Changed my handle to not cause confusion with "local girl"--apologies.) I understand that flinging allegations about Gausvik anonymously was bad form. What's pathetic is that at the moment, reading about Morrissey, I didn't care. I have heard (and witnessed) such pervasive sexism, racism, suppression and exploitation of staff at UVA for decades. I have known so many people who've struggled with depression at work, even PTSD in some cases. It has gotten to the point where I feel sickened by it--heartsick--and in the last couple of years I've just come to the conclusion that the level of corruption and social distortion, in the institution's core, is not only too high to dismantle...but it's also so unconscious that it is likely never to be reckoned with. (Check larger culture. Same.) Part of the reason I feel despair about it is that I am a professor's child and grew up running around the Lawn believing it was "my special place". Quite a shock in 1968 to find out I was unwelcome to attend UVA because of my gender. (They didn't admit women in schools other than Nursing or Education until 1971). I felt like a fool at 16 when my parents spelled it out. I'd always noticed all the boys, of course, but somehow never stopped to think of what it actually meant. My state's STATE university would not educate me! (My folks put me in the car, drove me to Mary Washington and said see, dear, this is where the girls go.) I never got over the hurt and shock--went north to school. And grad school. So my sensitivity to these things goes way back. May seem stupid to care so much, but my father was an extraordinarily decent man and as a child I identified with UVA with such naive pride. Finding out, gradually and inexorably, as an adult, what the real character of the institution was, was very painful. So, no excuses for posting like a coward--except that I have at 60 as much pain over all these UVA scandals of cruelty and injustice as a child from an abused home would have. Odd to say, but true. I've worked on it, not normally affected day to day. But thinking of Morrissey, his broken heart and despair at the coal tower, his courteous call to 911--just touched too many deep bruises. Thank you for your criticism, though. I needed it and I'm glad my other post was deleted. UFA who, are you saying that it's okay to hide behind anonymity and make serious accusations about another person? "I think folks need to know this in case they might think of going to HR with a complaint." Many people are under the mistaken impression that HR departments are there to help them. That is not so, they are there ultimately to help the company or organization that pays their salaries. Don't ever forget that...UVA or anywhere else. It's common sense for people to remain anonymous! It's real easy to get your address and your phone # on the Internet for someone to start harrassing you. But the issue here is truth vs fact! If you have never been bullied then you don't have a clue! "No one would be able to conceal this about themselves..." Genoways was an editor? Something I don't understand is why somebody would let their job drive them to suicide. No job is worth that. If it's getting down to that then it's time to leave and get away. Do what you need to do to get out of there. But you never take your life over something as transient as a job of all things. I haven't really seen this said, and I'm not sure why. Maybe people are afraid of treading on sensitivities and being politically incorrect. When people kill themselves we're supposed to automatically sympathize with them and believe they are a poor victim who had no other choice and were powerless to do anything about the state of their own life other than to take it, and I don't agree. Just because somebody is in their 40s, 50s and beyond doesn't mean there isn't still a *whole world out there* and lots of options. It's never too late to try something new and to take a new path. If it's getting to the point where one is going to kill themselves over a bad boss and nonsense working environment, then get out of there. *No job, and especially boss, is worth a person ending their precious life over. * It makes no sense to me. And the pain for the family and loved ones left behind, all because of some boss??!!....unimaginable. Shortsighted and selfish. Total lack of the bigger picture. We live in a world where people no longer take responsibility for what they do and say......and for the way they choose to react and respond. Mr. Genoways may very well have been everything that the detractors say he is, I don't know, I've never met the guy and I wasn't there, but even if he was and then some, it was still Mr. Morrissey's choice to respond to things the way he did. *No boss is worth that. There are other jobs out there. * Everybody has options. And I don't care if people feel that I'm being insensitive to the situation, I'm going to say it. Over the years I myself have worked in various incredibly toxic environments with nasty bosses who didn't even act like people, some definitely going out of their way to hone in on me and target me. And you know what I did in each and every instance? *I LEFT. * I found better gigs and made a better way for myself. I also came from a toxic and abusive family environment and I never for one second didn't know that all I have to do is hang in there until I can get away on my own and that there's a whole world out there waiting for me. But killing myself.......ending my own life over some bosses, etc. NEVER occurred to me. Why would you kill yourself over a JOB?? Some boss?? Even crazy family, when all you need to do is get away from them and make your own way? I just do not understand this. The man obviously had mental problems that went above and beyond whatever may have gone on with Genoways and I don't know if anybody out there has been willing to say that. Grown men don't just kill themselves over a bully boss and a job that can be replaced, not unless they're emotionally unbalanced. The people I do truly feel badly for in this situation are Mr. Morrissey's surviving family, loved ones, and friends. boooo!, in the time that you took to write that comment, you could have read the article that described Mr. Morrissey’s situation. It might have given you some insight into his motivations. I'm sorry, but no, I can't understand this. You don't kill yourself because your boss doesn't return emails, doesn't give feedback, or even because he/she belittles you or treats you with contempt. What you do in that sitution is quit the *job. * Not your entire *life. * I've been in toxic work environments, and I left. Period. End of story. I didn't kill myself. So I will never be able to understand his motivations. To understand would mean to relate in some way...as in, I could see myself doing the same thing. I said it before and I'll say it again: The man obviously had mental problems that went above and beyond whatever may have gone on with Genoways and I don’t know if anybody out there has been willing to say that. Grown men don’t just kill themselves over a bully boss and a job that can be replaced, not unless they’re emotionally unbalanced already. Booo------Are people born with mental problems? Obviously you didn't read all the articles and comments concerning VQR since July 30th! Do you have a degree in mental health? No one has the right to bully anyone, any age, or gender! It needs to be against the law and the bully should go to jail! Nobody said that people have the "right" to bully anybody. And nobody seems to be siding with the alleged bully in this case. What I said was that clearly Mr. Morrisey had issues if the way he chose to dealt with his workplace problem was to take his own life. Go back and actually read what I said. It's all there. I'm not going to repeat myself. I don't need a degree in mental health to know that a person obviously has mental health issues if they choose to *kill themselves* as a way of dealing with temporary workplace issues. That's a given. If somebody is an incompetant bully on the job, then they of course need to be held accountable for that. But the person who chooses suicide as their way of dealing with their issues also holds responsibility on their end for how they choose to react and respond to the events in their life. It's a two way street. And so far anything that I've read on this subject has failed to mention this. The only true victims in this situation are the family and loved ones left behind. With all respect to the anonymous commenters above, we don't know why Kevin Morrissey killed himself. We don't know if it was because of his workplace problems, or because of his depression, or because of a combination of the two. A longtime suicidal impulse could have been "triggered" by a workplace event, or the cause of his death might have been none of the above. Speculation on the subject is as useless as it is unseemly. In the meantime, the claims against Ted Genoways by some of his employees at VQR (one of whom is my wife) were limited to the way he treated them and to the toxic environment he created in the office. Those claims, despite being downplayed in the president's report, nevertheless seem to have been vindicated. What, if anything, the university will do about it is another question. That's what I think we should be focusing on. Brendan: Toxic work environments are pure raging heck for the supportive spouse. I am hoping for the best for you and yours. AphraB, I, also, am one of those supporting spouses, and it's heartbreaking to hear the frustration and despair reported from the UVa Med Centre. I cannot go into detail, because my spouse will surely be harassed further or even fired, if the Big Bad Boss reads this. Suffice it to say that my spouse has been to HR and EAP with little success. The CYA culture in UVa's management is a marvel of opacity and denial. I'd like to see, since it's partially state supported, the department responsible for that funding come in and clean UVa's dirty house. Dave McNair, thanks for your continuing coverage of VQR. It's chilling in the extreme, but also a cautionary tale. Genoways will keep his job. The current staffers will be removed to other jobs (I'm hoping, and jobs that pay the same). New staffers who do not understand (and who need jobs) will be hired. They will eventually complain to HR, and HR will cover up, dissemble, etc., yet again. Lather, rinse, repeat.